After spending the last two days discussing the booths that are available as part of the Food and Wine Festival, I’m going to move on the special events that take place during the festival. All of the culinary and special events are based on 2013 information. Some events may not return for 2014 while new events may be added for 2014. Whatever happens, you can come here for the information. Moving up the cost ladder, the next “level” of special events are culinary demo and seminars. These events take place every day and usually run two or three times per day. This event, in 2013, took place at 1, 3, and 5 pm on Monday through Saturday and 1 pm and 5 pm on Sunday. For $14 (tax included), guests can watch a chef create a dish in a the show kitchen located at Chef’s Showcase in the Festival Welcome Center. After the dish has been made, guests can sample the dish with a wine pairing. The seminar takes 45-minutes. At 6 pm, every day, guests learn about mixology and the art of making drinks. Each seminar is sponsored by an alcohol brand and the drinks will include the sponsor’s brand. This $15 event takes place on the Vineyard Stage at the Festival Welcome Center. Guests will be able to sample the drinks at the end. This booth houses a wide selection of beers from the more prominently known “micro-brewers” like Leinenkugel, Dogfish, and Sierra Nevada. 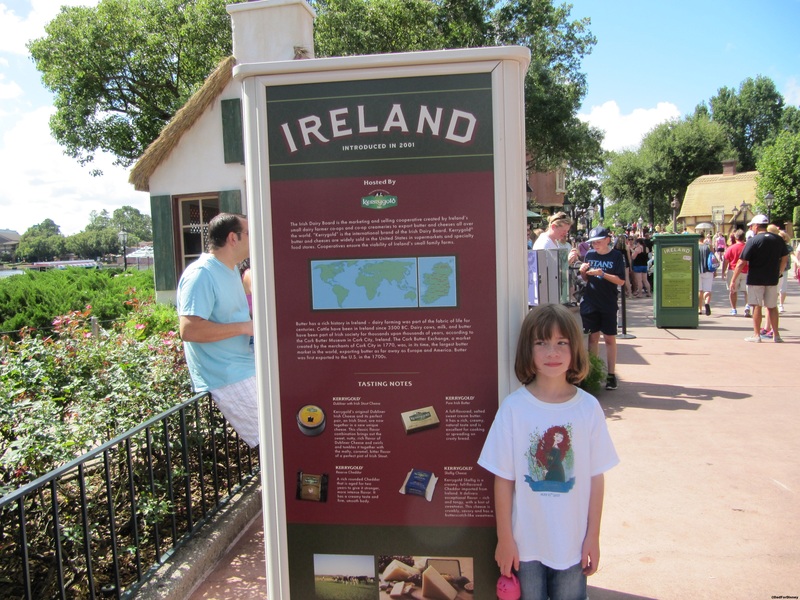 The Scottish and Irish booths are two reasons why the United Kingdom World Showcase pavilion does not sponsor their own pavilion. The Scotland booth was new for 2013 while the Irish booth has been a mainstay. Our smiling tour guide proudly let’s people know there are no beef, poultry, or pork options for a entree. 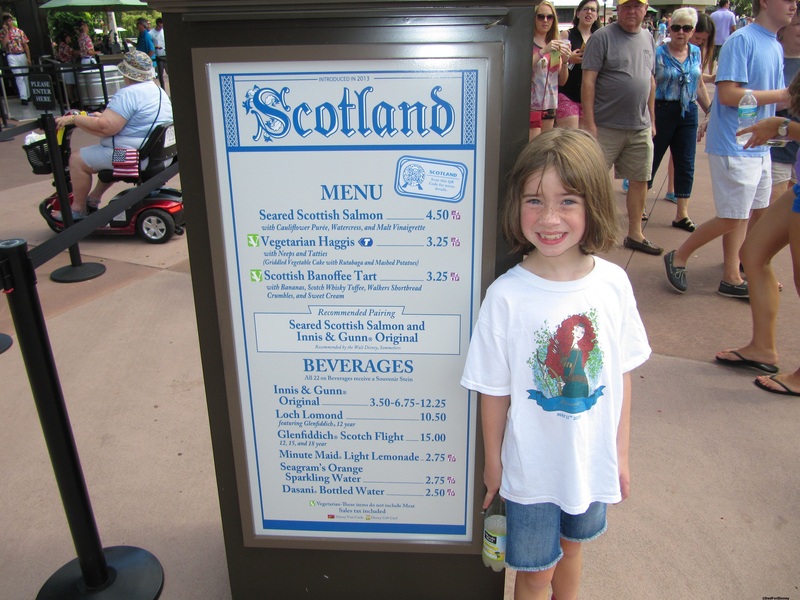 Scotland starts with a Seared Salmon and then two vegetarian options: A Vegetarian Haggis – though I’m not sure how one turns haggis vegetarian but Disney found a way. Also there is a dessert – a Scottish Banoffee Tart. Scotland brought a traditional 12-year Loch Lomond Scotch as well as a Glenfiddich Scotch Flight (12, 15, 18 and year scotch). They brought one beer: Innis & Gunn Original. The entry point for my tour guide and I was after Hawai’i going counter-clockwise and the heat and the fear of a full-scale revolt by the tour guide prevented me from getting a picture of the Hawai’i booth. Hawai’i brought traditional ocean fare to the festival serving a Tuna Poke with Seaweed Salad and the land with a pork slider with a sweet and sour pineapple chutney and spicy mayo sauce. Kona Brewing Company brought two beers to the booths: Big Wave Golden Ale and Pipeline Porter. One wine made the journey: Lucien Albrecht Gewurztraminer Réserve. The booth had one specialty drink a Aulani Sunrise with Ocean Vodka. This is a must visit booth on a my next trip. I missed out on it in 2013. Disney has a lot of tasty desserts on display. Starting with a Chocolate Orange Cupcake, Hazelnut Chocolate Cheesecake. The chocolate keeps coming with Belgian Chocolate Seashell Truffles and Frozen S’Mores. The lone non-chocolate option was a Cherry Pistachio Mousse. The champagne flows with three Moet & Chandon Champagnes: an Ice Imperial, an Imperial, and an Imperial Rose. Nicholas Feuillate had a second rose for guests to sample. Two entrees came to The Refreshment Port: fried chicken chunks in a pineapple sweet and sour sauce as well as Fried shrimp in a pineapple sweet and sour sauce. The Refreshment Port brought plenty of slushes for the guest to choose from. The Orange Dole Whip (available for a snack credit) and an orange dole whip with Creme de Cacao (not available for a snack credit). 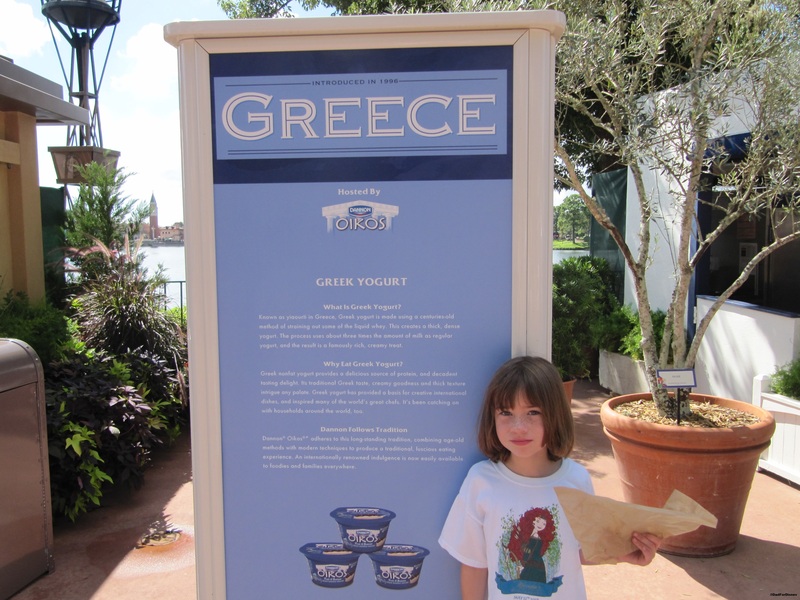 Greece didn’t have publicly displayed menu so our tour guide presents some history on Greece. Greece brought a variety of foods to the booth. They brought a Taste of Greece in some fried Calamari and a chicken gyro. Three vegetarian options were available griddled greek cheese, spanakopita, and Dannon had some Greek style yogurt available. Alcohol was available with an Ouzo and some Greek wines were also available: Alpha Estate Axia Syrah and a pair of Domaine wines. 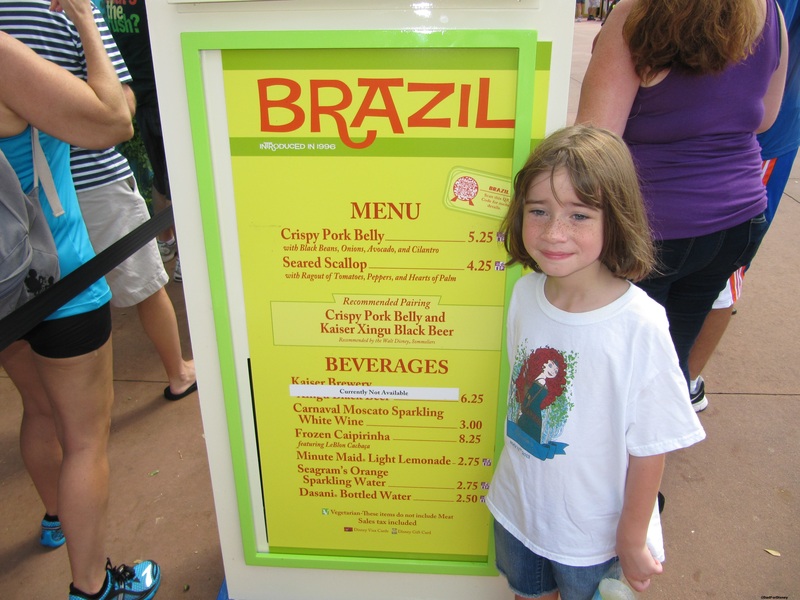 Located in the United Kingdom pavilion, the Irish brought their traditional Irish fare. Like Greece, the menu wasn’t available on the main display. The Irish brought the sea with a Lobster and Seafood Fisherman’s pie. Some excellent Irish cheese, which I’ve sampled on a previous visit. It comes as a cheese tray and features three Kerrygold cheeses which change from year-to-year. Lastly, Bailey’s made a warm chocolate pudding with a Bailey’s cream sauce. Guinness has beer available. There was also a honey wine and a chilled Irish coffee available as well. 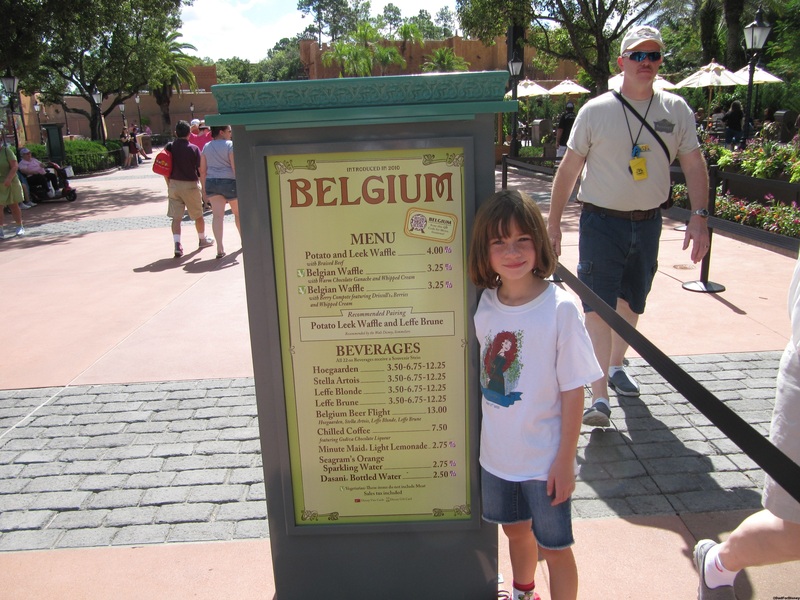 The Belgians were kind enough to provide us a menu for our tour guide to display. Belgians brought us two cuisines that they do and they do very well: waffles and beer. Three types of waffles: a potato and leek waffle with braised beef making it more a lunch/dinner waffle than a breakfast waffle. Two breakfast waffles adorned the menu one with a chocolate sauce and another with a berry sauce. Four Belgian beers made the menu which were available for purchase (not snack credit eligible) individually or a beer flight. A chilled coffee with chocolate liqueur also was on the menu. A guest doesn’t have to go far to reach the next booth. 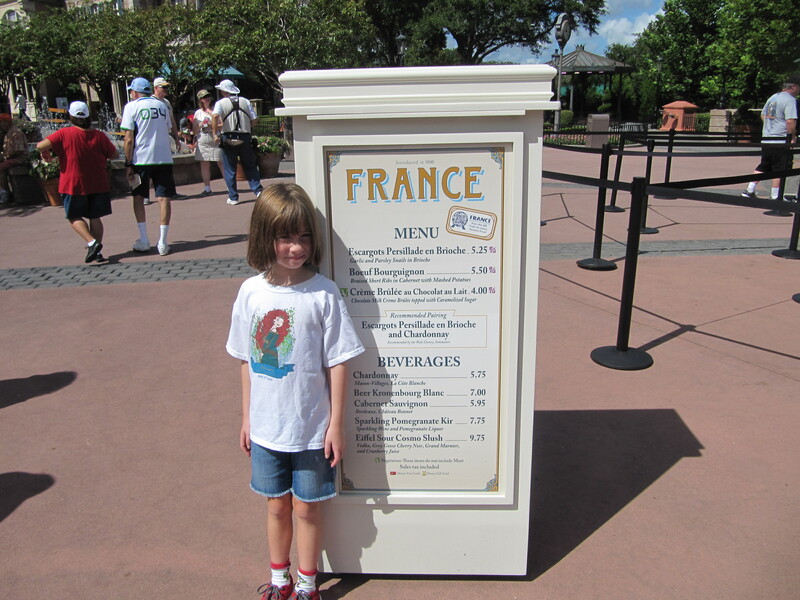 Our tour guide did an excellent job of shading her eyes and blocking some of the menu. New Zealand doesn’t have much for the vegetarian on the menu: mussels, lamb meatballs, and venison sausage made the menu. New Zealand makes up for it with its wine selection. Three Kim Crawford wines: pinot grigio, a chardonnay, and a pinot noir. One other wine a Sauvignon Blanc made the menu. If you like wine and meats that aren’t the traditional beef, poultry or pork, then this is the booth for you. 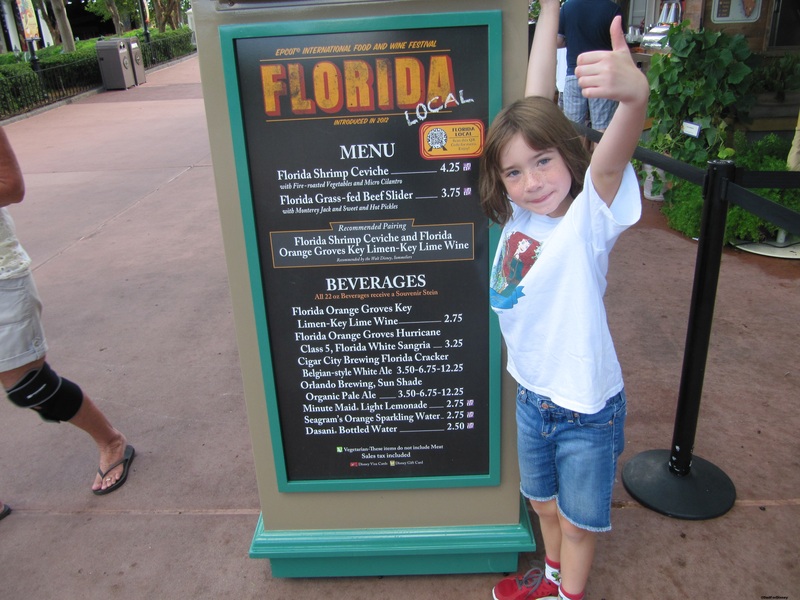 Our tour guide gives Florida a big thumbs up (mainly because she got a second lemonade) but I gave it a big thumbs up as well. The beef sliders are excellent with no sauce and sweet and hot pickles. The hot pickles weren’t too hot to take away from the taste of the slider. We passed on the shrimp entree. Both wine and beer are on the menu here. I tried the key lime wine which had a very tart taste to it. Two local brewers brought a pale ale and a white ale as well and a local vineyard brought in a white sangria. This booth is more an ode to the northeast US. Being from the northeast, I can get most of these entrees every day so I took the pass on them. Lobster is featured in two of the entrees: a grilled lobster tail and a lobster roll. The other entree is a New England Clam Chowder. One dessert is a craisin bread pudding with Grand Marnier sauce. Sam Adams has three beers available purchase as part of a beer flight or individually. Rouge brought a chocolate stout and a specialty drink: Iron House Fairy Tale Cuvee. We have no picture of tour guide with the menu and/or display but we do have a picture of one of the entrees courtesy of my wife who took some food pictures when she went on a solo tour of the festival. A kielbasa with a potato pierogie was one of the two entree options in Poland. The other option is Zapiekanki which is toasted mushroom, onions, and cheese bread with a homemade ketchup. One beer from the Okocim Brewery and a wine – a zinfandel was on the menu. The Brewer’s Collections is a larger menu of German beers that could be found in Germany. I try to joke with the Cast Members about when the Nation of Cheese will be applying for UN status but the joke usually goes over their heads. 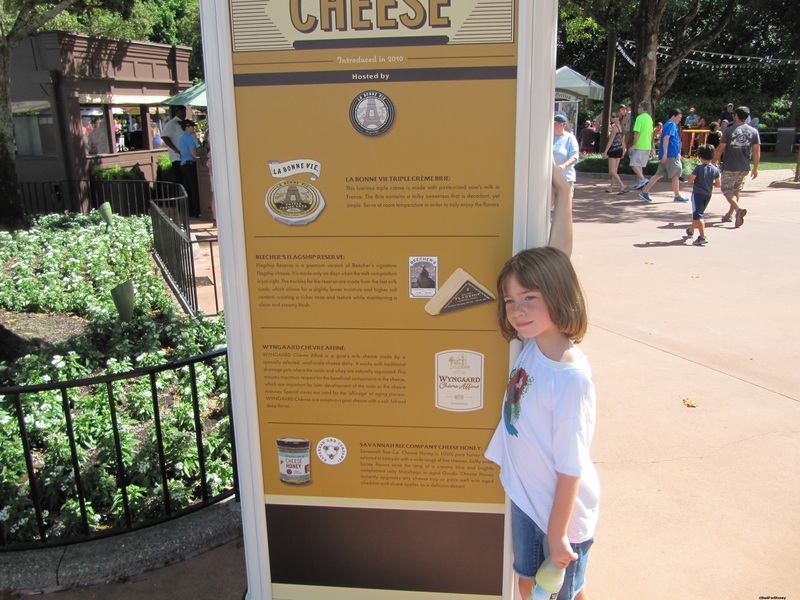 Our tour guide with the cheese display. If there is a display, it should be a nation. Cheese had two options: a crusted bleu cheese with fig jam and a cheese tray with cheddar, brie and gouda. My wife and I usually get the cheese tray. She gets the brie. I get the cheddar and we usually split the gouda. Once Upon a Vine provided the booth with four different wines: sauvignon blanc, chardonnay, a “Big Bad Red Blend”, and a pinot. 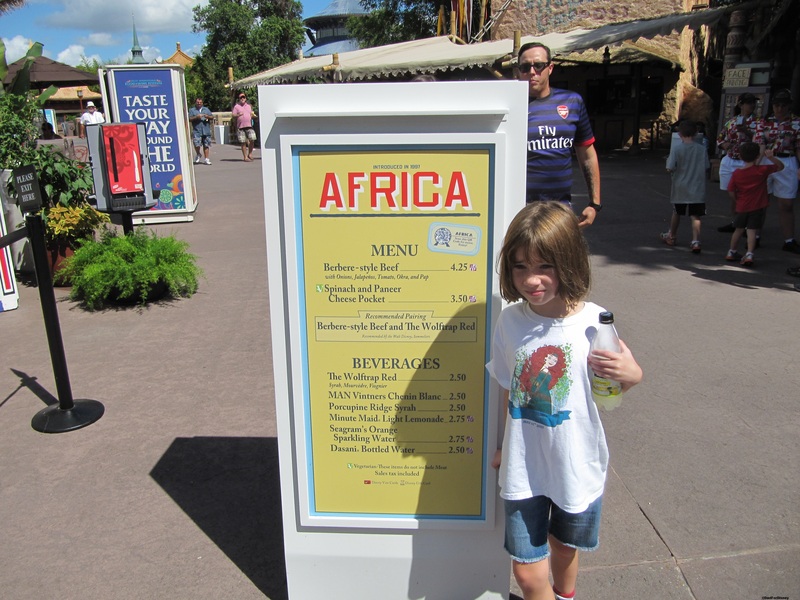 Africa is a booth which provides guests better wine options than entree options. South Korean cuisine isn’t my thing but there were two main entrees: a kimchi dog and a lettuce wrap. South Korea did make up for the lack of entrees with three alcoholic options: a blackberry wine, a soju and a soju fruit slushy. No menu on display so we got some history on Singapore instead. Menu-wise, like South Korea, there were two menu options: a chicken curry with coconut and jasmine rice and seared mahi-mahi. Three beverage options were Tiger Beer, a Singapore Sling, and Marques de Caceres Satinela. Our tour guide, who is getting rapidly grumpier (because we’re out of lemonade). 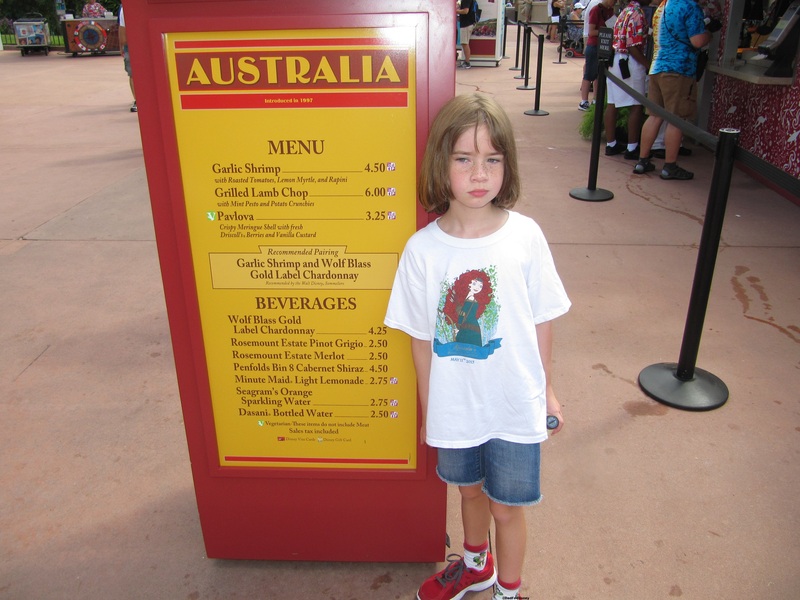 poses by the Australia Menu. The highlight in Australia is the wine. Four wines adorned the Australian menu from three different wineries. Grilled shrimp and a lamb chop were the two entree options and a Pavlova was the dessert option. The Pavlova was crisp meringue shell with berries and vanilla custard. Like Australia, the highlight in Argentina is the wine. Argentina had four wines on the menu. Unlike Australia, there was no vegetarian option just two beef options: a beef skewer and a beef empanada. The beef skewer look tempting but again fearing revolt from our tour guide by waiting in another line for food. I passed on that option. 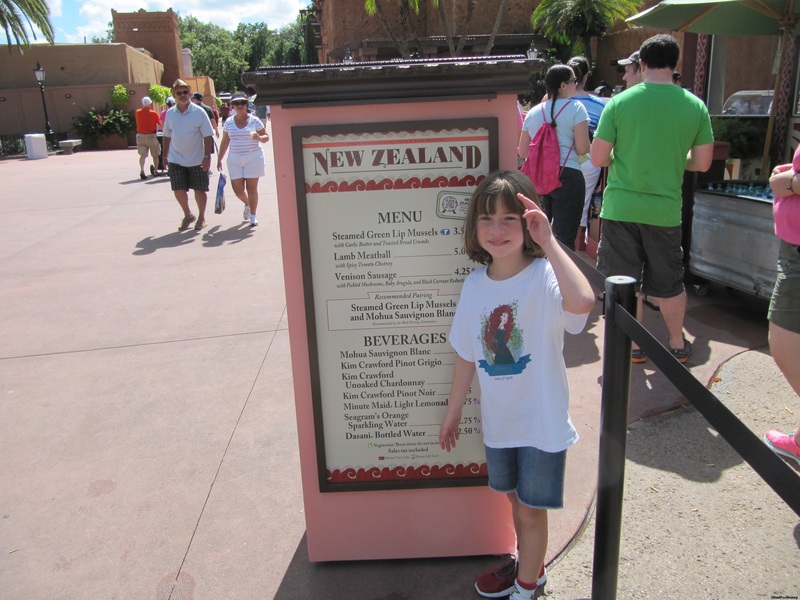 The pained smile of a tour guide who is almost finished her journey around the World Showcase. 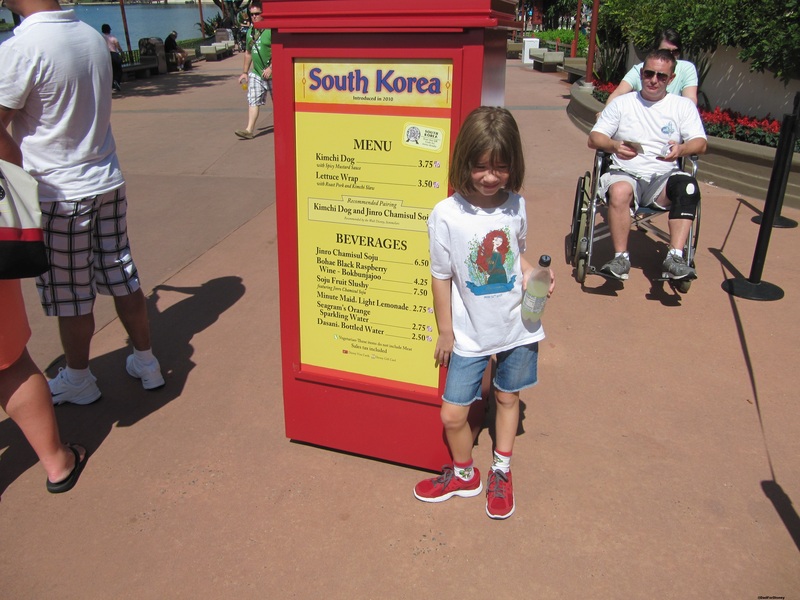 During our visit, only the white wine and specialty drink were available. However, both entrees: a crispy pork belly and a seared sea scallop were available. Terra is the vegetarian’s playground. All the food options here were vegetarian ranging from “Chick’n Curry” to a chili to finally a dessert in chocolate cake in a coconut mousse with passion fruit sauce. Fresh watermelon juice is only available at this booth. Two wines from The Vegan Vine were available and Napa Smith Organic IPA. 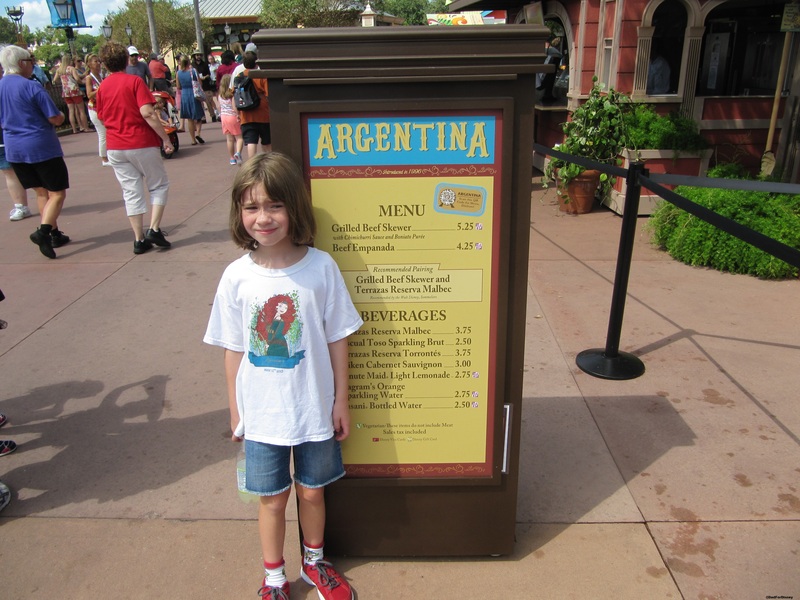 That concludes our journey around the World Showcase and the 30 booths at the Food and Wine Festival. Last night, after posting the world showcase booths, I came across some pictures that my wife took of food during the festival. Tomorrow, I cover the special events that take place during the festival. 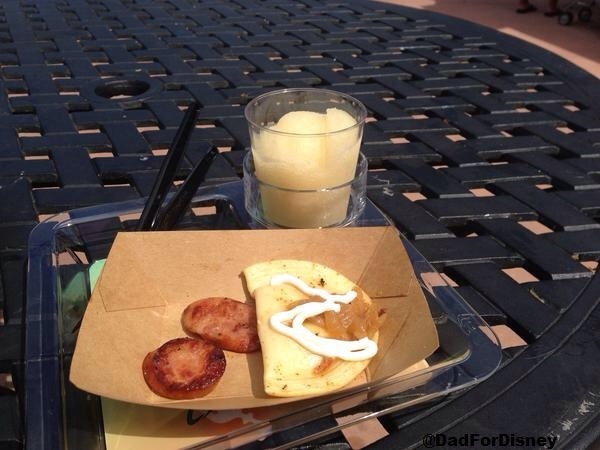 The next two days are going to cover what foods you can expect at the Food and Wine Festival. Today is going to cover the World Showcase booths. Tomorrow will cover the additional countries and booths that are brought in for the festival. I will give my reviews of the food where applicable. 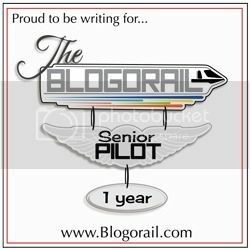 I’m not food adventurous and there are not a lot of things, at the festival, which “float my boat” but there is enough to make it a worthwhile experience for me. At the festival, food portions are on the smaller size more like something you would see as an appetizer than an entree. 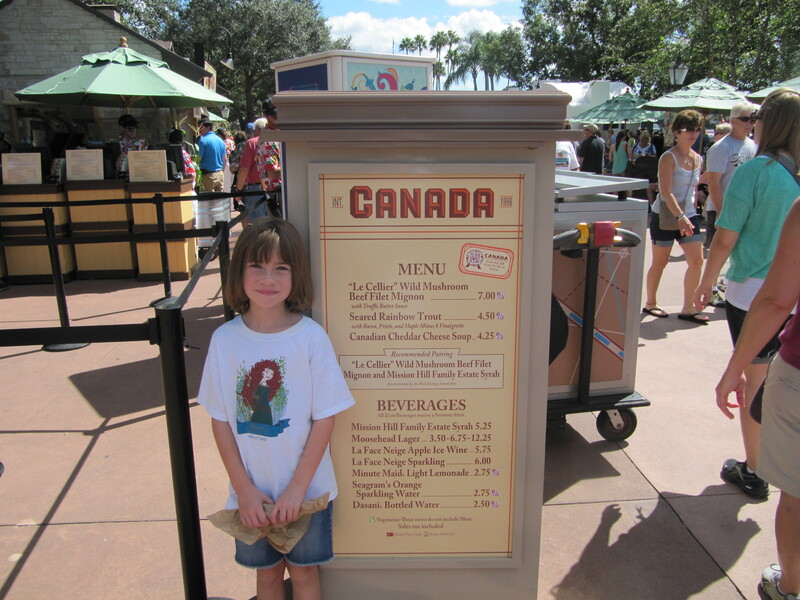 Canada brings us three entree selections: “Le Cellier” Wild Mushroom Beef Filet Mignon, Pan-Seared Rainbow Trout, and Canadian Cheddar Cheese Soup also from Canada’s Le Cellier Restaurant. 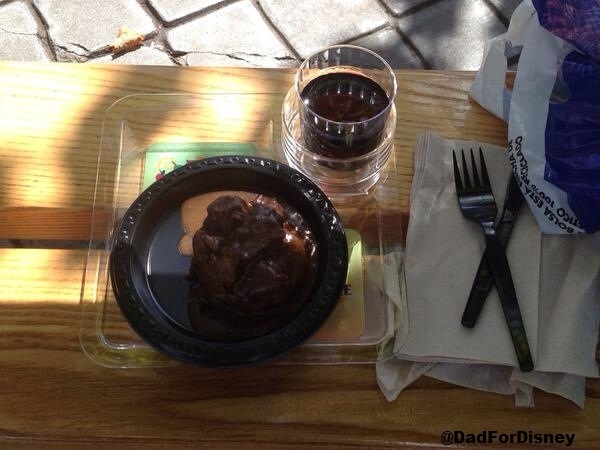 All three entrees are available for purchase for one Disney Dining Plan snack credit with the best value being the filet mignon. Tip: Any time a guest can turn something over $5 out of pocket into a Dining Plan snack credit, it’s a good deal. I’ve had two items from the entree list: the filet which was a bit overdone for my liking but still good and the cheddar cheese soup which is always good even on a hot day like the day when I was there. There are three wines on the list: Mission Hill Family Estate Syrah, La Face Niege Apple Ice Wine and La Face Niege Sparkling. I tried the apple wine. It was very good. More like a sparkling apple juice taste than a wine. One beer: Moosehead made the journey down from Canada. None of the alcoholic beverages are available for a snack credit. France also delivers three entrees: Escargots Persillade en Brioche, Boeuf Bourguignon, and Creme Brulee au Chocolat du Lait. Coming off the cheddar cheese sour and ice wine from Canada, I passed on the French selections. If anything, I would have gone with either the boeuf bourguignon or creme brulee. All the entrees were available for a dining plan snack credit. On the wine/alcoholic beverage side, France provides a lot of options. Three wines: Chardonnay, Cabernet Sauvignon and a Sparkling Pomegranate Kir (sparkling wine and pomegranate liquor). France also has one specialty drink: Eiffel Sour Cosmo Slush designed by the same people who designed the Grand Mariner Orange Slush and Grey Goose Citron Lemon Slush. Here we have our “Grumpy” tour guide in Morocco. It was a hot day and someone needed some lemonade to continue to get through the world. Morocco brings the standard three entree options: Harissa Chicken Roll, Kefta Pocket, Baklava; all of which were available for one snack credit. Moroccan cuisine isn’t my kind of thing so I passed on the options in Morocco. My tour guide and I still had a lot of countries to get through and the heat was starting to make both of us a little cranky and we weren’t halfway “around the world” yet. A little bit of shade brought some joy back to our tour guide. Japan has four entree options available and all for one snack credit. Three are varieties of rolls: a Spicy Hand Roll with tuna, salmon, and chili pepper as the main ingredients; a California Roll featuring avocado, cucumber, and crab; and a Teriyaki Chicken Roll with white meat chicken, rice, and teriyaki sauce. They also had a vegetarian option with a Youki Tofu. 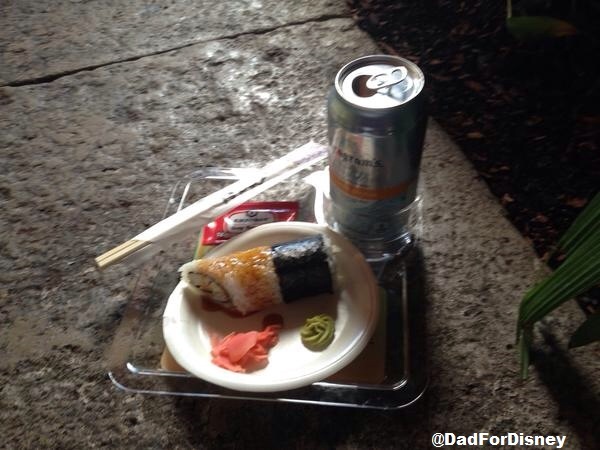 With four entree options, Japan had only had two alcoholic options: a Sake and Sapporo Beer. However, they also provide one non-alcoholic option with a Green Tea Colada. None of these options were available for a snack credit. Another country whose cuisine has a little appeal to me so we kept on moving to keep the tour guide in a good mood. Italy brought guests three entree options for a snack credit (even though our tour guide is blocking that part of the menu). Ravioli di Formaggio all’Emiliana which is a baked cheese ravioli in a beef sauce with parmesan and mozzarella cheese. Salsiccia e “Papacelli” Napoletani which is grilled sausage with peppers and onions on ciabatta bread. Lastly, they had a dessert option with a Cannoli al Cioccolato…chocolate cannoli. Like France, Italy brought five alcoholic options to the table: Pinot Grigio, a Moretti Beer, Prosecco, Chinati Placido, and an Italian Margherita. I stopped at the Florida Local booth prior to the Italy booth so I passed on the cuisine. If I were to stop, my top choices would be the grilled sausage and the cannoli. It wasn’t long before we reached our next stop. 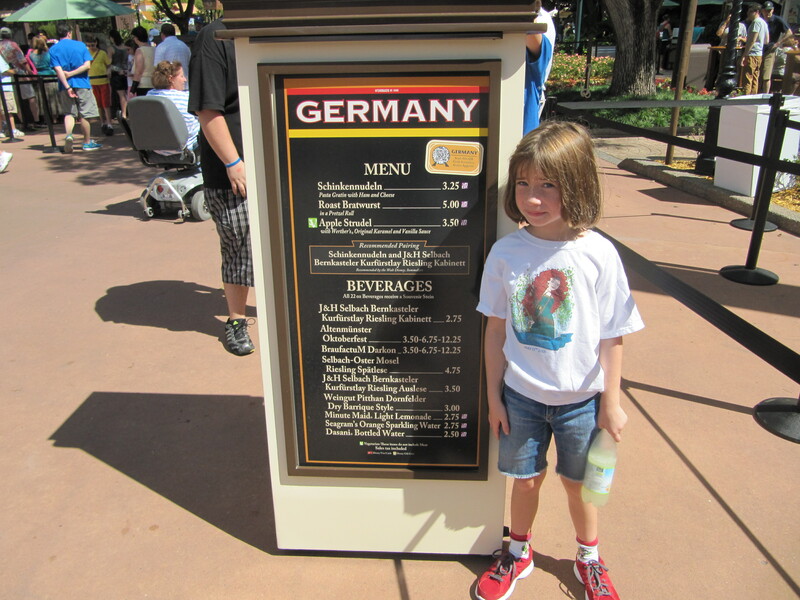 Germany is one of the more popular booths at the Food and Wine Festival. It’s a cuisine that a lot of people are familiar with and it has a wide variety of both beer and wine available. Germany only has three entrees available for a snack credit. Schinkennudeln – a pasta gratin. A roast bratwurst rolled in a pretzel roll and, lastly, a dessert option in apple strudel. My tour guide and I stopped in Germany to have a roast bratwurst. She did not care for the bratwurst and ate mainly the pretzel roll while I got to eat the majority of the bratwurst. The mustard sauce that goes with the bratwurst is a must. Then, we split an apple strudel. The alcohol at the Germany pavilion is expansive and includes both wine and beer. Two beer options: a Altenmunster Oktoberfest and a BraufactuM Darkon. There was also a Selbach-Oster Model Reisling Spatlese and a Weingut Pitthan Dornfelder Dry Barrique Style available as well. We moved on with fuller bellies to China. 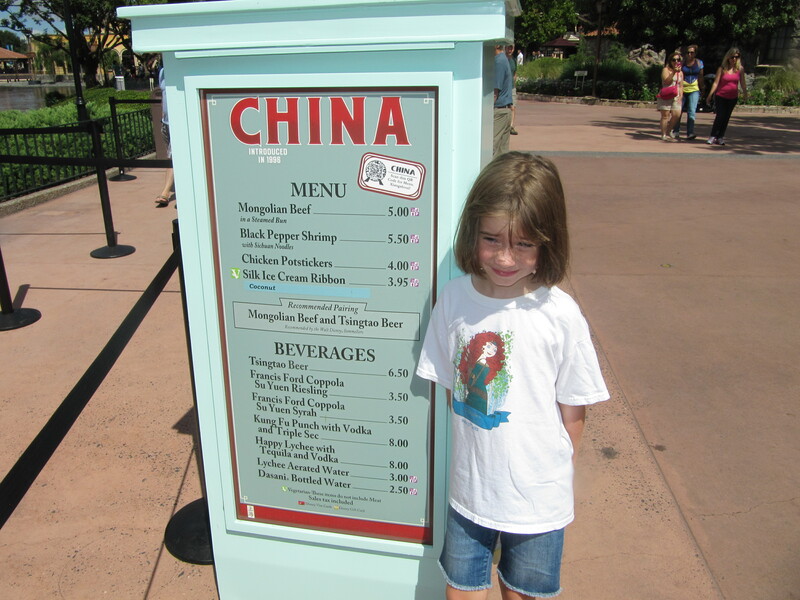 After a stop to meet Mulan, we made our way to the food area. China, a cuisine like Japan which doesn’t really appeal to me, had four entrees which don’t need much explanation available for a snack credit: Mongolian Beef, Black Pepper Shrimp, Chicken Potstickers, and Silk Ice Cream Ribbon with Coconut. If I didn’t have my tour guide with me, I would have been tempted to try the ice cream with coconut because I love coconut. A wide variety of alcohol was available starting with Tsingtao Beer and two Francis Ford Coppola wines: a reisling and a syrah. China, like France, brought in two specialty drinks: a Kung Fu Punch with vodka and triple sec and a Happy Lychee with tequila and vodka. 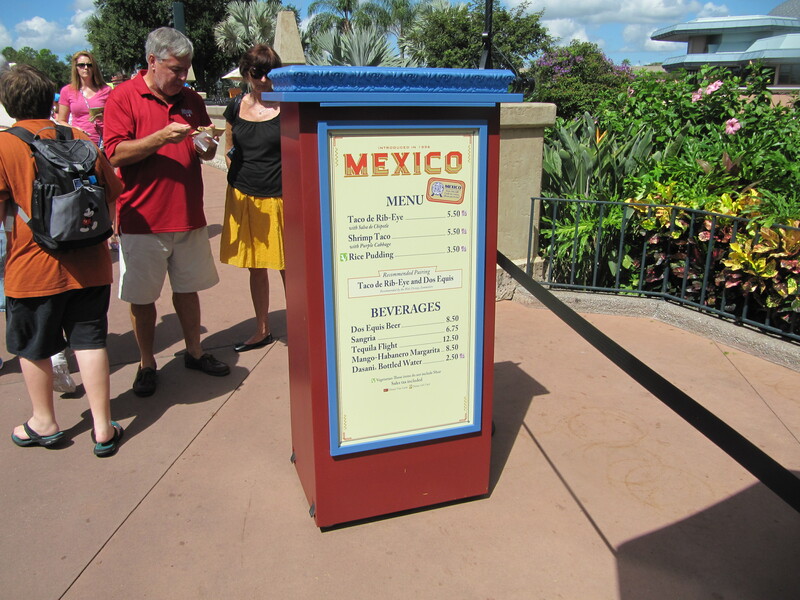 Finally, our tour guide and I came to our last World Pavilion showcase stop…Mexico. She missed this picture for a trip to the washroom. Mexico kept it simple with its entree options with a steak taco or a shrimp taco. It had a rice pudding dessert option as well. The alcoholic selections are, in my opinion, uninspired. Dos Equis Beer is available for their beer selection. A sangria to cover the wine selection. A spicy mango-habanero sounds very spicy. They also offered a tequila flight. None of these appealed to either me or my tour guide. The heat was getting us to the point where we just wanted to finish up our tour and head back to the hotel and the pool. 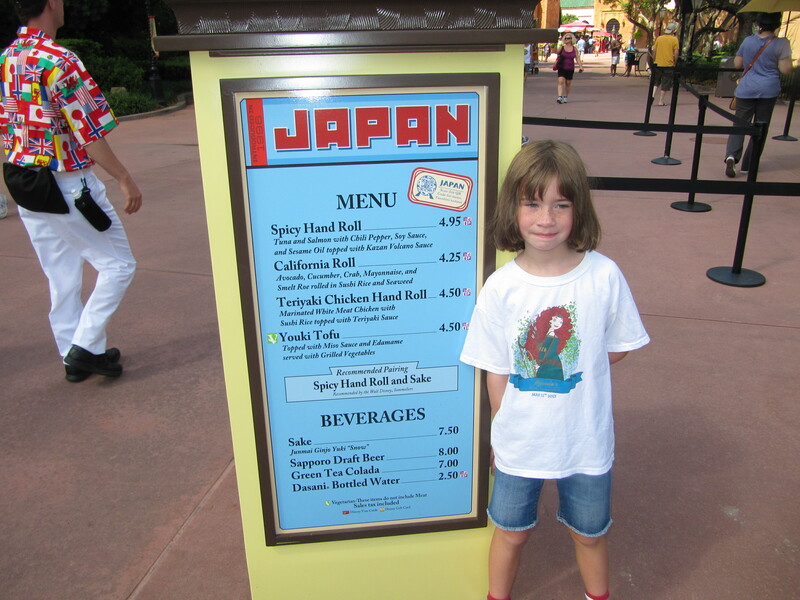 Some pavilions, but not all, have non-alcoholic selections (lemonade, water, etc.) available. That covers the World Showcase Pavilions. Tomorrow, we will cover the additional pavilions. 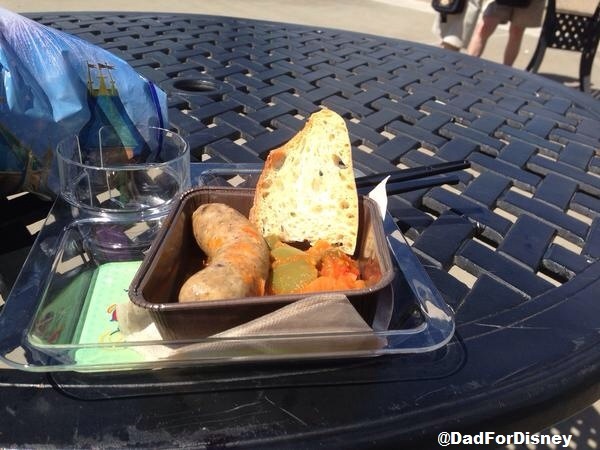 This week, I’m going to focus on one of the best events that EPCOT puts on during the week….Food and Wine Festival. In 2014, the Food and Wine Festival will be the longest in history at 53 days. It will run from September 19th to November 10th. The best part of this event is there is no “hard ticket” needed. You attend this event with just your standard Disney ticket or annual pass. This makes the event very popular as well. 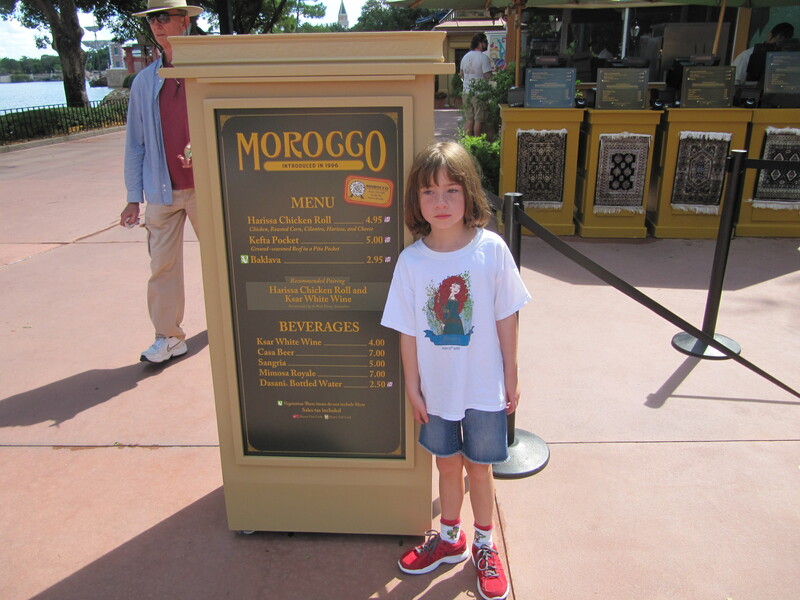 Disney has not announced what booths will be added to the World Showcase Pavilion countries yet for 2014. 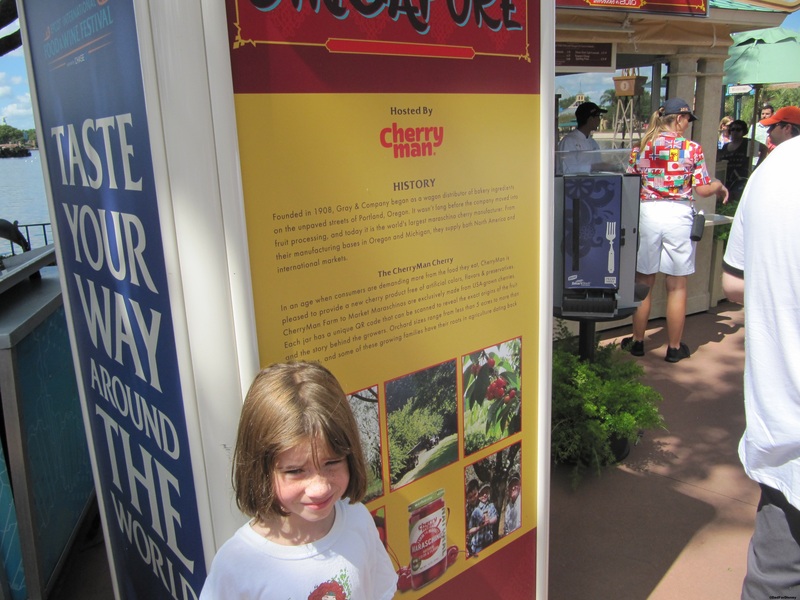 In 2014, there were 30 booths where a person could “eat their way around the world.” 22 booths joined 8 of the World Showcase Pavilion countries (America doesn’t officially have a booth and Norway and the United Kingdom did not sponsor booths). That’s a lot of booths, a lot of food, and a lot of drink. We’ll focus more on what’s served at each booth and how best to navigate the festival later in the week. These extra events are not included in the park admission. These are ticketed events and costs vary. The least expensive of these events are the culinary, wine & beverage, and mixology seminars. These events take place several times per day during the event and cost $15 in 2013. 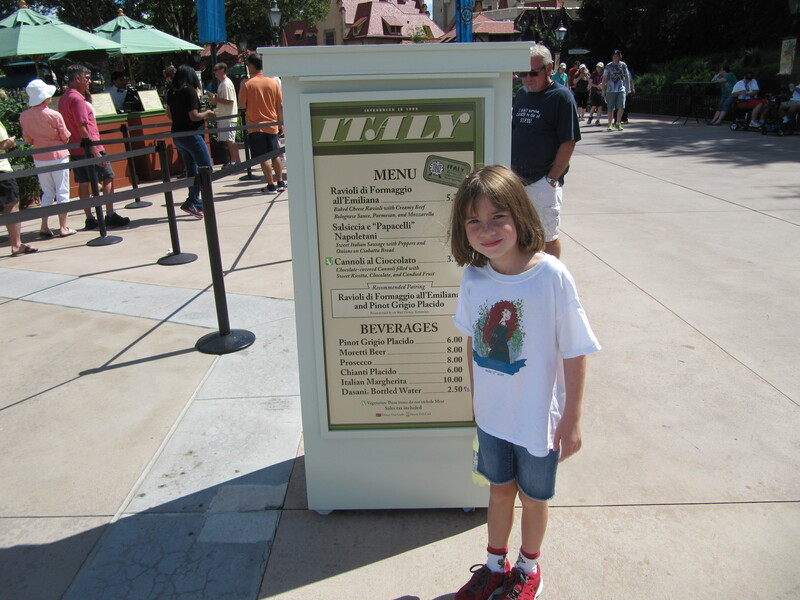 Disney also runs a variety of special dining experiences during the events. These events are not held everyday usually only three or four times during the entire festival. These events widely vary in price. In 2013, the price varied from the Parisian Breakfast for $37 to the Party for the Senses which cost as much as $285. What’s in store for DadForDisney for the rest of the week. Tomorrow and Wednesday, I’ll be going more in-depth about the booths and their meuns. Thursday, I’ll talk more in-depth about the Special Events. Friday, I’ll go over how to best navigate The Food and Wine Festival.